If Janet Yellen had not earned her Ph. D. in economics, she could have been a great short-order cook at Waffle House. Yellen is as long-winded as Bernanke. She lards her speeches with footnotes, just as he did. She is as evasive as Greenspan, but she uses academic jargon and peripheral statistics to do her work. Her first Jackson Hole speech shows how adept she is. First, some background. The FED said in December 2012 that an unemployment rate of 6.5% was one of the two benchmarks to use as a way to evaluate when to raise interest rates. The other was CPI growth at 2%. The CPI increase, July 2013 to July 2014, was 2%. In short, both of the targets have been reached. So, will the FED raise rates? Which rates? How? The European Central Bank has contracted the monetary base for over a year, and long-term bond rates have fallen. Meanwhile, the short-term ECB rate has dropped like a stone since October 2013. To avoid dealing with this problem — the #1 policy problem facing the FED — Yellen is waffling. Her speech was pure waffles and syrup. Here’s Peter Schiff of Euro Pacific Capital pointing out that the recent positive GDP numbers indicate that America is spending money – money that is just created by the Fed. The GDP “is goosed.” If the Fed decides to take all that easy money away, the propped up markets – stocks, housing, etc. – will collapse. This, combined with the fact that most people don’t see the value of gold in this environment, makes Schiff even more bullish on the metal. James Rickards of Tangent Capital gives his critique of Ben Bernanke’s performance during his tenure as Chairman of the Federal Reserve. While some in the main-stream want to give Bernanke credit for ‘saving’ the global economy during the crisis of 2008, Rickards points out that Bernanke’s Fed helped create the crisis in the first place! In a recent interview, Kyle Bass, the well-known founder of Hayman Capital, revealed that “There’s no real way out” of the current economic situation that has resulted from the fiscal profligacy of the central banks. And later in that same interview, when asked his opinion of what the ‘average investor’ should be doing in this environment, Mr. Bass could only make the suggestion that they “should be very careful doing what the central bankers want them do.” With low yielding interest rates, the central banks are pushing average investors into taking on more risk with higher yielding equities. But it’s even worse than that. Fundamentals don’t seem to matter much in these uncharted economic waters. Why? Because as Barry Ritholtz has so thoroughly outlined in his Big Picture analysis of the markets – they’re all rigged! The average investor is at the mercy of the big banks and crony capitalism. Yes, be very careful indeed! The ‘bad idea’ to attempt to resolve the national debt problem by minting a trillion-dollar platinum coin. Supporters say the US Treasury would be able to deposit said coin with the Federal Reserve to act as an asset, backing part of the outstanding debt. As Jim notes, this is not an honest approach to discussing the root problem – which is based in the monetary system, itself. Besides that, the idea is preposterous and just shows how crazy this system has become. Things don’t hold value because someone says they have value. A thing has value based on the public/market demand for that thing. Prior to 1971, government spending was constrained by both interest rates and the fact that there was some semblance of a gold-backed currency via Bretton Woods. But today, we have neither constraint – the Fed’s zero percent interest rate policy combined with the current, purely fiat monetary system has created the unstoppable spending spree that has led us to these extreme levels of debt. If there is anything left at all as a bar against further spending, it is the debt ceiling. But even that is now being threatened with a proposal to remove it entirely. The just announced appointment of Jacob Lew as Treasury Secretary. Jim is holding judgement in order to see if there will be any honest discussion regarding the real problems of the monetary system. Congress lived up to their reputation and kicked the can once more. Essentially, tax rates were raised (such as on those making $450,000 or more and estate taxes went up from 45% to 40%) but spending cuts were deferred for a couple months, entailing yet another round of political saga to come. 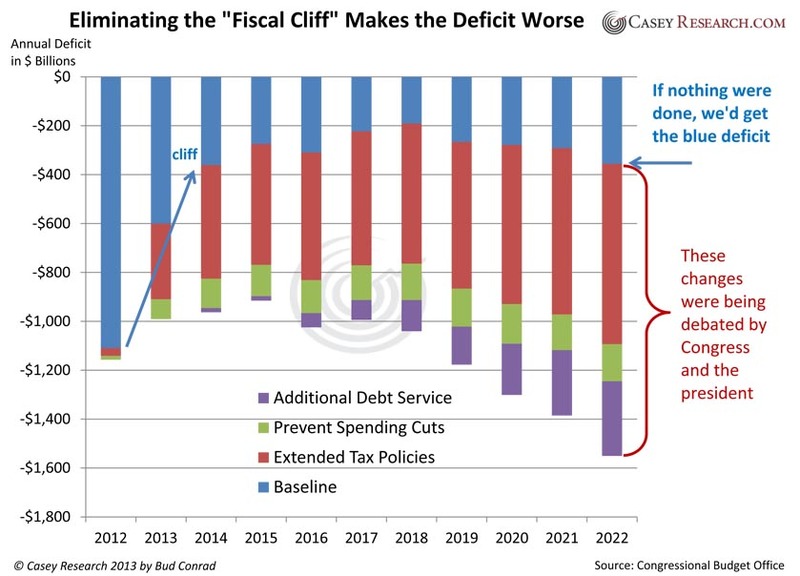 So, as the following chart from Casey Research shows, the deficit situation has not gotten any better. In fact, according to the CBO, it’s worse – earlier estimates had not even considered the interest payments, so the annual deficit will be $60 billion more than originally anticipated. On January 1, 2013 the US will face the real possibility of falling off a fiscal cliff and may take down much of the global economy with it. Specifically, the cliff is represented by three factors, which policy makers must overcome in order to avoid another severe recession – or worse, depression. The Bush Tax Cuts are set to expire at the end of 2012. At a time such as this, when the economy is stagnant, any tax increases will only serve to further sour any potential business activity. On the other hand, the government annual deficit spending is already at $1.2 trillion and if revenues aren’t increased, budget deficits will only get worse. Mandatory budget cuts are set to take affect. Last year, when congress was unable to agree on a long-term plan to tackle the never-ending growth of the national debt – now over $16 trillion – the temporary measures they initiated allowed for a small ceiling increase, while putting in place a special super-committee to study the situation and recommend policy. The super-committee came and went without any agreement, which automatically instituted a $1.2 trillion cut in government spending – half from domestic spending and half from defense spending. These cuts are set to go into affect starting in January, 2013 at about $100 billion per month and last for nine years. The debt ceiling is again being breached. Last year, when the ceiling debate was the centerpiece of discussion, lawmakers were unable to reach agreement on a debt reduction policy. They were only able to conclude a temporary measure, allowing for a small increase in the ceiling while the super-committee furthered the discussion. The current debt ceiling limit of $16.394 trillion is coming up fast. It should be obvious that the real problem is that there is simply too much debt! But then again, what should one expect when the whole monetary system has become based on debt? In today’s world, money only comes into existence when someone is willing to borrow it from the banking system. This is why the Fed and all the other central banks try so hard to keep interest rates low – as more money is borrowed, the banks are able to use fractional reserve banking methods to increase money availability even more. The economy keeps chugging along as long as people and companies are willing to borrow more. But this debt-based system obviously has its limits, as the current economy has been showing. People and companies are unwilling to burden themselves with more debt. The Fed’s policies have been trying to overcome that by keeping interest rates low so that the government can keep spending borrowed money in order to sustain the perception that the economy is okay. It is impossible for the governments to ever repay these debts, which is why the central banks will continue to employ “QE” measures, just as they did in early September, when the ECB in Europe, followed by the US Fed, and finally the Bank of Japan all embarked on major money-printing policies to keep the debt-game going a bit longer. In relative terms, it wasn’t that long ago when money was based on real, tangible assets, such as gold and silver – assets that couldn’t simply be conjured up out of thin air. These are the real assets that people should be seeking now, especially since saving cash in a savings account yields next to nothing in interest. Plus, as the governments of the world continue to print money to cover unpayable debts, the value of all fiat paper money will only continue to decline. However, investors in precious metals will want to get their priorities straight. Many gold bugs, for example wish to keep their precious metals close – where they can actually touch them. Possession is nine-tenths of the law, after all. Having physical possession of one’s precious metals has benefits, especially in the case of a complete financial collapse, which some say is inevitable, given the shape of the current over saturated debt system. Having real money to barter with under those circumstances may be priceless. On the other hand, not everyone is comfortable holding physical precious metals in substantial quantities. Private storage can be a risk, which should be weighed carefully. For those concerned about the safety of private storage, or even those seeking diversification can look into alternative ways to hold precious metals. One convenient method is to use Exchange Traded Funds (ETF) traded on stock exchanges. Whether open-ended funds like GLD and SLV or closed-ended funds like PHYS and PSLV, the investor should be aware that there are still risks to overcome, such as the stock market itself. Yet there are other ways people can invest in precious metals. Companies such as BullionVault allow their clients to buy and sell precious metals online, via an internet browser. Once purchased, the metal is physically stored in various geographically separated regions of the world. This immediately accomplishes two things – diversifies assets across national boundaries, which reduces some sovereign risks and also relieves the investor of personal storage responsibilities. Perhaps some combination of all of the above methods, or others not covered can be sought after for the potential precious metals investor. When the debt-system finally collapses, people will wake up and remember what real money really is and wonder why they never thought about it before. It’s funny, isn’t it? Something so vital to every day activities, yet so little thought is given to what money really is. It’s good that some people are waking up early. A fantastic summary of the Fed’s QE program, the Fed’s true motive, what it really means for the economy and realistic expectations are revealed here by Peter Schiff of Euro Pacific Capital. Presented without further comment, in two parts below…. CNBC’s European Squawk Box had an interesting interview session with author and economist, Richard Duncan. Looking back over the last 40 prosperous years, ever since the last remaining link between the US dollar and gold was removed, the world has evolved into a form of financial creditism. Duncan notes that the central banks of the world have been able to provide easy credit and the world has greatly benefited. However, there comes a point where borrowers are unable to take on more debt. If the government does not step in and provide QE or some other kind of spending programs, there will be another Great Depression. Duncan even goes on to say that, in fact, a depression is unavoidable and inevitable, but it can be delayed if the government decides to benefit society further by spending on 21st century technologies in the nano science and medical fields, for example. Another interesting part of this segment that should be noted is where the panel brings up the comparison of the present situation with the past, where central banking policy was to raise interest rates rather abruptly in order to curb reckless borrowing. “When you throw money into the system ….. the good guys out there won’t borrow and spend because they’re too cautious. It’s the bad guys who come in and borrow and spend. … There’s lots of bad guys around, we can see them all over the place – we know they’re there!” Touché. Get lucky. That is, if the country is lucky enough to grow their way out of the debt by having a healthy economy with low unemployment and a steadily rising GDP, the country could easily pay its debt over time. Default. The country simply refuses to pay its debt. Financial Repression. Inflating the country’s monetary system to the degree in which the debt becomes relatively meaningless. So far, the U.S. economy has not shown significant improvement in employment and GDP growth, so option #1 is out. A default would be too unpopular for politicians wishing to keep their offices of power. So even though option #2 would be beneficial long-term, it’s off the table as well. In the middle of 2011, Bill Gross, managing director of PIMCO, referenced a paper on Financial Repression written by Carmen Reinhart and revealed his fund was going short U.S. Treasuries. Since that time, the fund has lost value due to this call because the U.S. Treasury market bubble has still not burst. But Mr. Gross was not wrong – perhaps his timing was off. The U.S. is indeed embarking on some form of Financial Repression in order to address its debt burden. So, what is Financial Repression? Simply put, the goal for the U.S. under this strategy is to sustain a modest level of inflation. For example, if a 4% inflation level can be kept up over a period of 10 years, with compounding, half the debt can be melted away. Of course, the U.S. Federal Reserve will not publicly state that rate, but instead declare the target of around 2%. Nevertheless, the inflation rate doesn’t have to be that high, just kept consistent over time. According to Reinhart’s paper, there are 3 mechanisms which serve to sustain a certain level of inflation. The first is caps on interest rates. With rates at or near zero, it’s rather obvious the Fed has been successful in keeping rates low. And in mid September, 2011, the Fed initiated Operation Twist, which rolled maturing short-term bonds into new long-term bond purchases having the affect of pushing longer term interest rates lower. The second mechanism is to ensure there’s a market for U.S. bonds – that is, make sure someone is available to buy the securities on offer by the Treasury. With interest rates so low, this is a difficult task. The Fed was supposed to be the buyer of last resort. But recently, they’ve overtaken China as the largest holder of U.S. debt. However, during the bail-outs of 2008, the banks received a lot of money in order to keep their capital ratios up. So far, that money has been parked in accounts at the Fed earning some interest. When called upon, these banks will use that money to buy U.S. Treasuries. The third mechanism is to have capital controls in place that ensure there is no banking competition. All the banks in the system are banks in line with the Federal Reserve System. There can’t be any rogue banks out there deciding not to play the Treasury game as planned. Under this strategy, the U.S. government debt can be inflated away. But there are losers in this game. First, people who save their money see their savings eaten away – they get little to no interest on their savings and as inflation rises, the value of their money decreases. Second, those purchasing the Treasuries lose as well for the same reason – low interest rates. Understood in this manner, the inflation sought under Financial Repression is a hidden tax. Another interesting point Reinhart makes in her paper is that in order for Financial Repression to work in the long run, investment in gold needs to be discouraged or even prohibited. Investors cannot have any alternatives, but to invest in the target securities. But thankfully, that’s not the case today. People are able to buy gold and silver and thus protect themselves from this inflationary strategy.